We all have stories in our heads that drive how we behave and how we make decisions. They also drive how we see the world and our place in it. One common story small biz owners tell themselves is that they could be more profitable if they only had more money and more time. Of course they can buy more time by hiring others to take the load of maintaining the web site, doing social media, paying the bills, etc., so it really does come back to money. It is an easy story to tell ourselves life would be so much better if we only had more money. The problem is that this is a false story. It is a trap, but a comfortable one. The truth is that constraints (and money certainly is a big one) force you to be more creative. Constraints let you see opportunities in another area. I learned this when I worked in corporate marketing. Big money doesn’t automatically lead to great ideas. Actually it can lead to lethargy. One memorable example was when a new Marketing VP was hired. She was given a big budget. That led to hiring a big-name creative agency. The result was ho-hum marketing ideas accompanied by an expensive brochure (nicknamed the tombstone for its somber marbleized cover). That brochure, including all the creative and print costs, was equal to our total former marketing budget. And yet it was a complete waste. It didn’t promote our superior product. It got no one interested in what we were selling. In fact, the sales reps were so embarrassed about it they refused to hand it out. Years before the brochure fiasco we had been a small company with limited resources. Our marketing department was proud of being “the best marketing department built on a glue stick and paper clips brought from home.” We had passion. We were forced to be creative. We had fun. And we were effective. When we were an independent company my product line may not have had money but at least we were an important part of the company’s success. However, after being acquired by a global software company, my product line was definitely the unwanted and ignored step-child. We were a rounding error in the company’s financial statements. We needed a new story. Soon after we were acquired planning began for the yearly company user conference. This was a big deal and on a larger scale than anything else we had been involved with. The budget was $15 million. Eye-popping numbers for us. 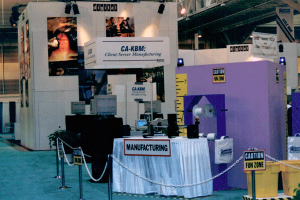 Each product line was given space in the Expo Hall and expected to have a worthy exhibit. We were given a budget of $300. That’s right out of $15 million, all they could spare for us was $300. We set to work. Our product was manufacturing software for custom manufacturing. Think custom-sized doors and windows. So it was a no-brainer that we needed to focus on a custom product. But what? The obvious choice was to build custom picture frames. The trouble with obvious choices is they are so, well, obvious. And dull. Our Quality Assurance Manager came up with the idea of custom jump ropes. This got a lot of laughs but little support. But as we couldn’t find a better idea, we came around to the possibilities of jump ropes. And so we set to work to build a Rube Goldberg machine out of scraps and recycled parts. Our idea was to build a mini custom jump rope factory and get people involved in the process. People would come to the front of our booth and get measured (height and arm span) for their ropes plus they could pick their choice of color for the handles. Then they would move along our assembly line watching one of our technicians (dressed in a borrowed lab coat and hard hat) reel off the right amount of rope from an oversized spool, cut the exact length with a large paper cutter and send the rope to be fitted with the handles. To keep this true to a manufacturing situation, the jump rope would move to Quality Assurance where the new owner of the rope was required to prove it was the correct length. This required a jump rope demonstration. 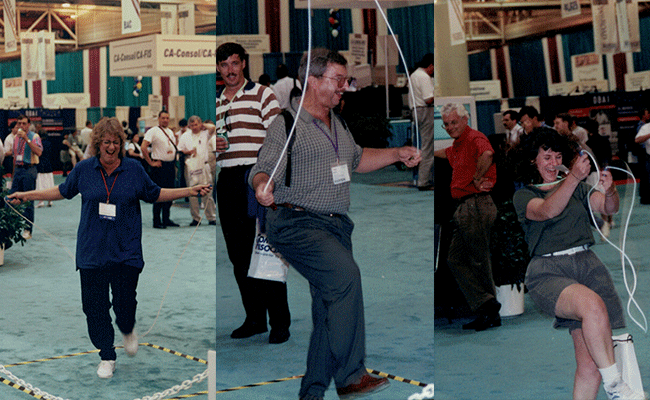 Jumping rope at a trade show? Sheesh, the surrounding companies has spent fortunes for booths with slick games, multimedia and expensive prizes. We were jumping rope. We had the last laugh. The booth really took off as the employees working the booth got into their roles. Those doing the greeting and measuring had different personalities. The guy running the QA (testing) center went all out. As a local singer/actor he was up for this gig. With microphone in hand he challenged the jump rope owner to jump and then gave a live commentary on how well they were doing (or not doing). Sometimes two people would join in doing Double Dutch style jumping. A surprising number of people remembered childhood jump rope rhymes and sang out. Soon we developed a crowd. Unexpectedly the booth staff across the way (a booth with very few visitors) joined in. The lined up their chairs and armed with black Sharpies and printer paper they started judging the jump rope skills Olympics style. News of the booth spread throughout the show. We had a never-ending line of people waiting to get ropes. The final coup? The local morning TV show came to do a segment on the event and they specifically asked to see the jump rope booth. We were on TV! 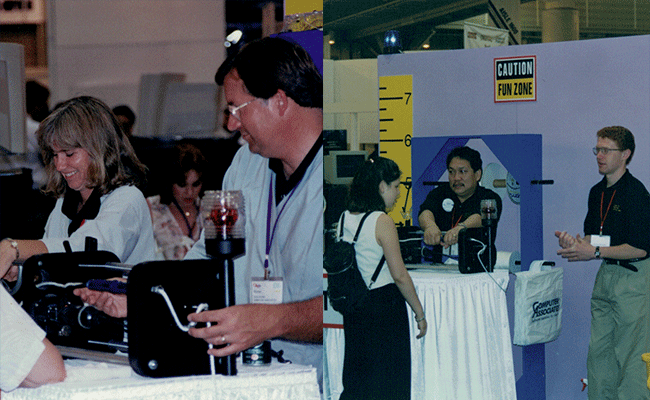 Eventually our little jump rope factory lived on for several years and went to Germany and the UK for trade shows. A budget allows you to be lazy. Constraints force you to be creative. Always choose creativity over money. Good ideas come from unlikely sources. Be open to all ideas. And don’t be too quick to eliminate ideas. Some need time to marinate. Get a team. No one person had all the ideas for our successful jump rope factory. The magic was the layering of ideas and their interaction. Sparks setting off other sparks. The best ideas came on site, not in a planning meeting. Improvisation really carried the day. Don’t be afraid to take a risk. Some ideas are flops. OK. Move on. But often the idea isn’t the determinant. It is what you do with the idea that counts. Don’t forget the branding. We used personality, personal attention and fun to engage our booth visitors. These were attributes of our product brand. Don’t forget the stories! Our booth brought back great childhood memories. It brought up stories of their current children and grandchildren. We watched as people created their own rituals by striking up conversations with strangers, but who were connected by the jump ropes they carried. Carrying one of our ropes became a badge of honor. Take photos of your efforts and share the process. We weren’t in the photo craze we have now, where every moment is recorded. The few print photos are not very good. Now you can bring your followers along during the entire creative process. Next time you are facing a constraint, look for places where you have strength. 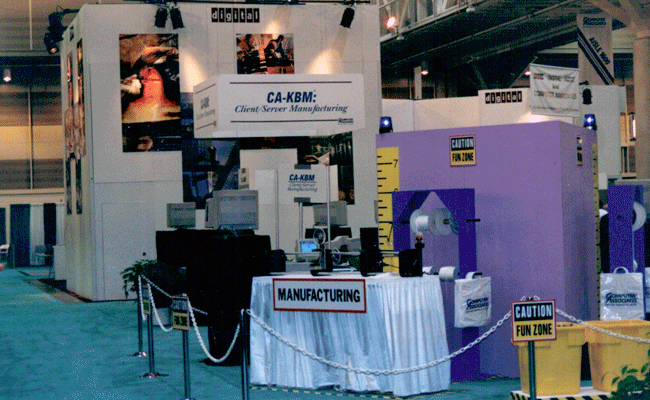 It turned out lack of money was not a factor in creating our trade show booth. We were only limited by our imagination.